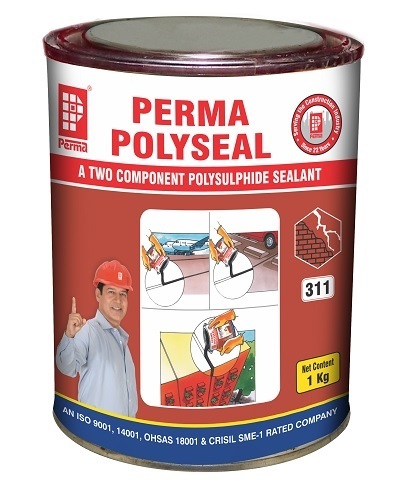 Perma Polyseal is a two part poly sulphide sealant based on poly sulphide resin, curing agents, select fillers, plasticisers and vulcanising agents. when the base and curing a get are mixed it forms an uniform colour mass which can either be poured in to the horizontal expansion joints or gunned into the vertical joint depending upon the grade. Essentially Perma Polyseal is available in tow grades. pouring grade for horizontal application and gun grade for non slump vertical application. Perma Polyseal is an expansion joint sealant useful in sealing horizontal as well as vertical joints. Perma Polyseal is used for sealing reappearing cracks on the roofs, shear cracks in the brick works and joints in water tanks. Perma Polyseal is used for sealing gaps between the building material of different structures such as concrete and wood, glass and aluminum, and exterior glazing. It is used in expansion joints varying between 6mm to 50 mm. Perma Polyseal accommodates the movement of structures because of expansion contraction and also because of deflections and settlements. Perma polyseal is tough floor joints treated with Poly sulphide can be traffic able. Perma Polyseal when dry gives an aesthetic smooth grey appearance. Packing : Perma Polyseal is available in 1 Kg & 4 kg packing.